Members of Monica Melissa Patterson's defense team work in the courtroom during her capital murder trial Monday, October 16, 2017 in the 370th state District Court in the Hidalgo County Courthouse in Edinburg. EDINBURG — Gloria Hernandez testified Thursday that she was driving on State Highway 107 when she received a call that her 96-year-old patient had died. The licensed vocational nurse was among the witnesses called to testify near the end of the fourth week of the Monica Melissa Patterson capital murder trial, providing insight into the victim’s health the day he died. Hernandez said she saw Martin Knell Sr. the morning of his death on Jan. 28, 2015 — this during a weekly assessment of his health — and described him as “talkative, alert (and) in good spirits.” This is why Hernandez told jurors she was surprised by the news of his death, regardless of his age. The prosecution alleges that Patterson killed Knell by asphyxiation on the day in question to access his estate. Prior to Knell’s death, the defendant was named payee upon death on his bank accounts and stocks and was both executrix and a beneficiary of his will. Her team of four defense attorneys, however, argues that Knell — who suffered from heart disease — died due to sudden cardiac arrest. The defense believes this is why he showed no symptoms of heart failure during the nurse’s visit. Patterson, meanwhile, has remained tight-lipped about the allegations against her, but broke her silence during a break in testimony on Thursday. 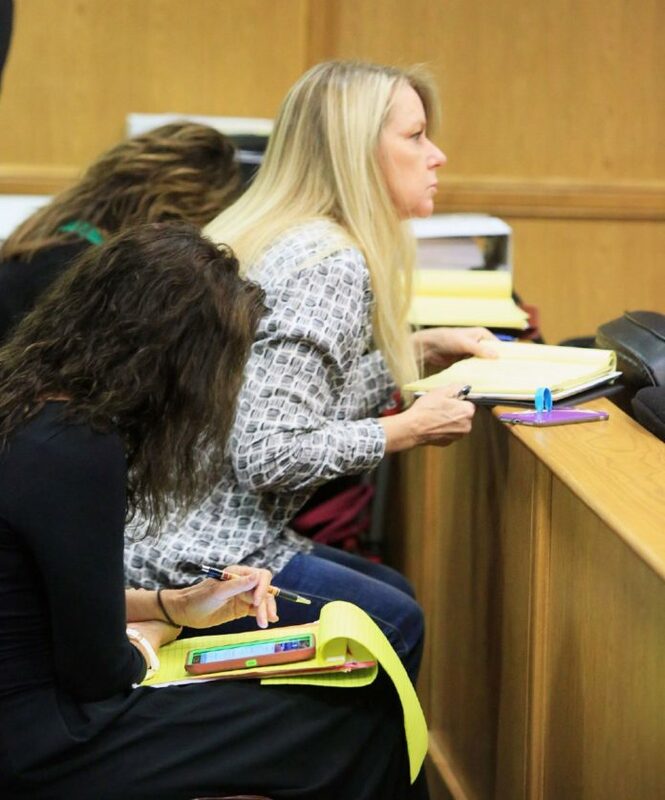 The defendant’s critique of the trial’s coverage was not the only instance in which she’s spoken to media, having told a photographer from The Monitor to “make me look good” in passing. As the defense decided to delay its opening statement until the prosecution rests its case, it was up to one of her attorneys, O. Rene Flores, to offer a counter narrative through his cross-examination of Hernandez. “Given that cardiac arrest is an electrical problem, you would agree that sudden cardiac arrest actually occurs without any symptoms,” Flores asked the witness, to which she replied in the affirmative. The defense attorney was persistent in his questioning Hernandez on the difference between a heart attack and cardiac arrest. Flores then pointed out the “comorbidities” Knell faced, noting that the victim took medication for a long list of diseases. These included coronary artery disease, hypertension, multiple myeloma and anemia. Flores also brought up that Knell had atherosclerosis, heart stenosis and cardiac hypertrophy — an approach that seemed to call into question the nurse’s knowledge by quizzing her on medical terminology. Although Hernandez testified that Knell was taking medications for these issues, Flores said “sometimes the light turns off” — speculating on the manner in which the victim could have died. Conversely, the prosecution questioned Patterson’s quality of care for Knell when it was revealed that he fell in the shower while at the defendant’s house. “Is it considered good caregiving to let a 96-year-old man fall in your house,” Joseph Orendain, assistant criminal district attorney, asked, to which Hernandez replied negatively. The witness further noted that a good caregiver would be in the shower with a patient, or by their side. “People just fall; 96-year-old people just fall,” Flores responded. Earlier in the day, the defense finished their cross-examination of Texas Ranger Robert Callaway — one of the lead investigators in the case — which may lay the groundwork for their case. It was revealed that multiple phone calls were made between Knell’s live-in caregiver, Celestina Mascorro, and Angel Mario Garza on the night before Mascorro called 9-1-1 to report that Knell was unresponsive and not breathing. Knell had employed Mascorro a couple of weeks before his death. The defense has cast Mascorro, who came forward about the alleged murder a month after it occurred, in a suspicious light throughout the course of the trial. Garza, who has also been charged with capital murder for his alleged role in Knell’s death, awaits his day in court. Although Callaway said he knew what the calls were about, hence why he did not consider Mascorro a suspect, he couldn’t reveal this information to the jury since it was considered hearsay. Thursday’s testimony from these witnesses came after the judge relieved a juror and replaced him with an alternate for “good cause.” This was as a result of the juror’s financial situation given the length of the trial. “It is causing you physical and emotional stress to a point that you cannot concentrate on this case and follow your oath, is that correct,” state District Judge Noe Gonzalez asked the juror, who replied in the affirmative. Texas law does not require employers to pay employees called for jury duty, and jurors are paid $40 a day. This switch, which comes on the heels of Wednesday’s removal of another juror, leaves the court with two remaining alternates as the trial heads into its fifth week.